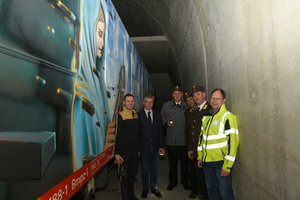 Since 2016, the Tyrolean State Fire Fighters’ Association and BBT SE have been cooperating to be ready for emergencies in the Brenner Base Tunnel. High standards in terms of tunnel safety have been set for the construction of the world's longest underground railway line. Among other things, the safety concept provides for three emergency stops, 20 kilometres apart. Of these, two emergency stops are located in the Austrian project area (Innsbruck and St. Jodok am Brenner), the third is in Campo di Trens in South Tyrol. In the event of an accident, people can be evacuated from the tunnel system by rail or emergency vehicles as well as buses. 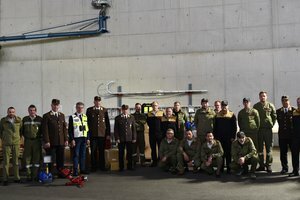 In order to be well equipped for operations during the construction phase of the Brenner Base Tunnel,a joint cooperative effort is ongoing between the project company BBT SE, the Tyrolean Regional Fire Fighters’ Association and the local Fire Fighter Departments in the project area. This cooperation was contractually agreed upon in 2016 and will last until the end of construction of the Brenner Base Tunnel. In addition to financing special training courses, this cooperation also enables the purchase of special equipment for use in the tunnel system. In the presence of the Regional Fire Brigade Commander and Regional Fire Safety Director Ing. Peter Hölzl, LFI DI Alfons Gruber, Regional Fire Brigade Deputy Commander and Regional Fire Safety Deputy Director Hannes Mayr, Director of the Fire Brigade Academy DI Georg Waldhart, District Fire Brigade Commander and Head of the Fire Safety Council Reinhard Kircher, District Fire Inspector Michael Neuner, BBT SE CEO Prof. Konrad Bergmeister and Mag. 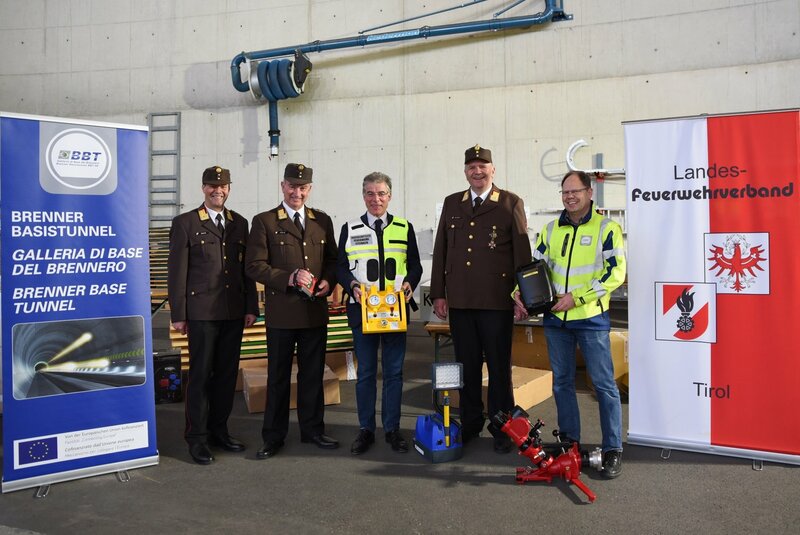 Erwin Reichel, BBT SE's safety coordinator, on March 1st, 2019 presented further special equipment to fire fighters in the Wipptal and Stubaital Departments at the Tyrolean Regional Fire Fighters’ School. In his speech, LFK LBD Ing. Peter Hölzl explains: "We hope that there will never be any difficult underground operations in the BBT. Nevertheless, we must be prepared. Contractual agreements ensure both training for possible emergencies in the tunnel system and the right equipment needed by the fire fighters in the event of an accident." He also explained that the cooperation between BBT SE and the Tyrolean Fire Fighters’ Association works perfectly. With such a project, there are many safety challenges to be overcome in the tunnel, but these are tackled very professionally by the fire fighters. 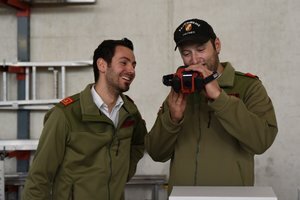 BBT SE's CEO Prof. Konrad Bergmeister explains that modern equipment is important in case of emergencies: "But it is also crucial that the best trained firefighters are well trained in using this device." For Prof. Bergmeister, the fire fighters are a strong and reliable partner in every respect when it comes to safety: "We are delighted to be working together on this project of the century, which will be the longest railway tunnel in the world. Participating in the BBT project is both a challenge and a honour." LFI DI Alfons Gruber, who is responsible for the technical details, explained the individual devices, such as long-term breathing apparatus, lifting equipment, thermal imaging cameras and emergency radio equipment. When selecting the equipment, he attaches great importance to the safety of the rescue forces and the suitability of the equipment. Furthermore, he thanks the Tyrolean Regional Fire Fighter's School for managing and inspecting the equipment before today's handover to the fire fighters. Following the handover, Prof. Bergmeister had the chance, inside the training tunnel used by the Regional Fire Fighters’ School, to view the training car used for railway fire drills and the new, artistically designed passenger train wagon used for "tunnel reality training".